This review and others posted over at my blog.Set in Canada in the 1960s, Polly and Rose meet after Rose’s parents move to the other side of the two-family home. Rose attends private school, where she’s largely unnoticed by classmates and teachers alike. Her parents are almost never home, working hard for the sock company that her grandfather founded. Rose deals mostly with the housekeeper, Kendrick, who barely speaks to her, leaving Rose feeling (justifiably) isolated and alone, seldom speaking or even eating.Polly, on the other hand, can’t get a moment alone in her house. She has an older sister and two younger twin brothers, as well as three foster sisters. Her parents seem to have no time for her, as they’re busy working and keeping up with the rest of the family. Polly escapes to a room in the attic, desperate for some time to herself (though her little brothers know just where she’s hiding) when she hears singing coming from the other side of the attic. After constantly wishing for an adventure like she reads about in books, Polly believes that the voice she hears is coming from a ghost.The girls form an unlikely friendship, after much resistance on Rose’s part. Polly, while obnoxious in her persistence in believing Rose is a ghost, is utterly charming. I enjoyed how each girl’s life delved into how loneliness can manifest and affect us all differently. It added emotional depth to the fantasy plot and a quote I found especially moving comes from Polly, in reference to her mother always being busy with the other children:“She always thinks I can manage, but sometimes I need her and she just isn’t there.”There’s a bit of mystery involving Rose’s family history (nice little rhyme there) and an actual ghost in the story as well. The story is told in short little chapters (one or two pages or so) from each girl’s point of view. They often pick up where the other’s narration leaves off and it kept the plot moving forward, while the two perspectives kept me trying to figure out what was actually going on.The end was somewhat predictable, yet as the story moved towards its close, it began to have a bigger impact on me. The more I thought about everything that had happened, the more moved I was, and this book definitely made me cry. There’s certainly a somewhat uplifting message contained in this ghost story, but I’ll be honest, this book made me depressed. But that’s a good thing! I’m always going on about books that get me going emotionally and I love anything that has such a deep impact on me.I 100% recommend this story and I’m excited about Cotter’s next release in 2018. If you like your middle-grade with a darker tone, but emotional depth, I think you’ll enjoy The Swallow.I received this book for free from LibraryThing in exchange for an honest review. This does not affect my opinion of the book or the content of my review. All opinions in this post are my own. Several books that I’ve read recently promised ghostly content, but ultimately disappointed me. I’m happy to say that The Swallow is a satisfying ghost story that really delivers.The Swallow is the engaging tale of Rose and Polly, two girls growing up in Canada in 1963, sharing a preoccupation with ghosts. The ghosts are creepy, and these girls are really brave as they try to resolve the spooky mysteries in their lives, whilst also exploring their new friendship.But while I adore the story, there are some frustrating weak points in The Swallow. Each chapter includes alternating viewpoints between Polly and Rose, and while these girls are distinct characters, their narrative voices are very similar. When the two interact with each other, I occasionally mixed up whose perspective I was reading from. I also feel as though I wasn’t deeply immersed in these characters’ lives. There isn’t enough detail, and I didn’t really get to know any of the secondary characters. Of course, Rose and Polly are at the center of the story, but that doesn’t mean that the background should be casually glossed over.However, despite its flaws, I loved reading The Swallow. I expected the story to be very predictable, but it’s definitely not - the mystery kept me wondering for quite a long time. The plot is creepy and unexpected, and quite heartfelt as well. A perfect read for getting your yearly fix of autumn spookiness!Thank you to NetGalley and Random House for providing me with a copy of this book in return for an honest review. I loved The Swallow: A Ghost Story. It ticks a lot of my personal boxes. I grew up adoring ghost stories, so I identified with the plucky Polly who wants nothing more than to see a wandering spirit. On the other hand, I was a rather morose child, so I also identified with the sombre Rose, who feels like a ghost because no one in her family seems to talk to her anymore. I normally don't read children's fiction but this one drew me in right away. It's set in Toronto, my home town, so I recognized many of the settings (the eerie Necropolis cemetery, the Bloor viaduct, many of the street names). I love how the author weaves this tale and the reader is never quite sure if Rose is alive or dead. The ending was perfect, or at least, it felt perfect to me. This book delivers on sweetness and the friendship factor and I loved these two girls. Happy ending? Well, that depends on your perspective but from the beginning the reader knows something is amiss between Polly and Rose and the spirits haunting Rose's home. I found it a satisfying conclusion and I'd be pleased to read more of Charis Cotter's work. "The Swallow" was the second book that I had read by the middle-grade author, Charis Cotter. I was very eager to begin this novel after reading her "The Painting". Both premises of each book intrigued me as a twenty-one year old, because these were eerie and creepy stories that I would have loved as a middle-grade reader if they were around when I was that young. I was explaining to someone yesterday that, of course I still love middle-grade fiction, because I loved it years ago. "The Swallow" follows (ha, rhyme) Polly and Rose, who become friends as they sit in their neighboring attics, only connected by a secret passageway. Polly has the uncomfortable and worrying fear that Rose is dead and is a ghost, while Rose is absolutely fed up with seeing ghosts all of the time. She knows she's alive, but why does she see them at breakfast, at school, everywhere she goes?A few fascinating and heartbreaking twists and turns occur, and we leave Rose understanding her true purpose as a girl who can see ghosts, that she is to help them move on. This is a very sad, very beautiful book. This novel is more about friendship, while "The Painting" is more about family, but they are both very relative to middle-grade readers. I sincerely enjoyed "The Swallow" more than "The Painting", but these are both excellent novels that I've had the pleasure to receive and review. The dialogue is believable, the sadness is easily felt and sympathetic, the love is palpable between Polly and Rose. I thoroughly recommend this.Naturally, every book does come without faults. Who would I be as a reviewer if I didn't mention the not so wonderful aspects? To be honest, there really weren't that many. I think that the plot twists were excellent and very fitting for the story, but they were a bit WOW RIGHT NOW IN YOUR FACE AHHH HERE YOU ARE BE SAD NOW. I wish they unfolded a little more naturally rather than the last third of the book. I felt I needed a little more time to recover than I received. I usually am not a fan of excessive resolution, but I would have liked a little bit more in the last two chapters or so. After a massive plot twist as it was, I needed a little time to nurse the booboos.Additionally, perhaps the plot twist could have been a little predictable? I in no way predicted it, but it was a very distracting day with my lunatic dog, so I could have been reading this more intently than I was. So maybe some of you could predict, but not me! Lastly, the only last thing I dislike was that there were a few moments of confusion where I had to re-read passages, because the way the sentences were worded. This is definitely one of those books where each chapter ends dramatically like "And then, I found a hidden door." "Then, I saw a shadow behind me." It's a bit cliffhanger-y, and that kind of confuses me occasionally as to what I read rriiiiight before the cliffhanger. I think if you end up reading this, you'll understand what I mean when we reach the point where the girls find a secret box.In conclusion, I absolutely loved this. Charis Cotter is a fantastic middle-grade writer, and I cannot wait to continue to read her books. *I received this book as a complementary review copy*.P.S. I mentioned this in my review of "The Painting", but my goodness, I absolutely love the cover art. Beautiful selections as always. Set in Toronto in the sixties, this book is about two lonely girls living in homes that attach to one another. Polly has a huge family with foster siblings too. She feels ignored by all of them, though she can’t get away from her twin brothers and their noise. That’s how she finds her way into the attic as a safe place away from the bustle of her family. Polly has always wanted to meet a ghost, which is why she thinks that Rose is a ghost the first time she hears her singing in her neighboring attic. But Rose turns out to be a real girl, who just happens to look very ghostlike too. Rose has always been able to see ghosts, and she hates it since they never leave her alone. Rose spends a lot of her days alone, no one at school talks to her, her parents are very busy business people, and the housekeeper ignores her. So the two girls quickly form a close friendship, made even closer by the frightening ghost that looks just like Rose and who threatens Polly’s life. Can the two girls figure out who this ghost is and what she wants?I seem to be on a roll with Canadian children’s book authors lately, and this is another wonderful Canadian read. Cotter creates a mystery inside a ghost story that twists and turns delightfully along the way. Readers will think they have it all figured out and then the story will change. Yet somehow Cotter makes it all work and in the end the entire novel makes great sense, enough that readers will want to start again to see the clues they may have missed.The writing here is exceptional. Cotter writes with a confident voice, one that allows each of these girls to be entire unique. The two of them are quite different from one another, each clearly resulting from their very divergent upbringings. The friendship also reads as real with small arguments happening regularly and the two girls having to repair these small issues. Through the entire book there is a wonderful ghostly presence, a feeling of being in a real place but one unseen by others. It’s a place that is a delight to visit.Perfect for reading under the covers with a flashlight, this strong ghost story is both entertaining and riveting. Appropriate for ages 9-12. 'Twas a bad case of cover love that drew me to this book. In a world packed to the brim with covers that blend together, the beautiful simplicity of The Swallow: A Ghost Story called to me. Once I'd read that it was set in the 1960's, and rife with ghostly happenings, I was sold. I love Middle Grade reads anyway, but this one in particular seemed something I'd all but devour.Things started out well enough. Although I wasn't completely in sync with Polly or Rose, I was fascinated by their shared ability to see ghostly apparitions. From the first moment that Polly mentioned seeing the specters, the book had this slight air of menace. I know, that sounds odd. It's just that Cotter does a wonderful job of helping the reader understand that Polly's particular ghost isn't quite nice. Not nice at all, in fact. That being said, for the age group that this is aimed to, I'd be a bit wary. There are mentions of ghostly attacks that, while they didn't bother me one bit, might spook a younger reader.What I couldn't get enough of during this read, truth be told, was the setting. I don't want to say too much and risk spoiling anything, but I would so have loved to live in Polly's or Rose's homes. They spoke of times gone past. Of hidden secrets, and musty attics. Even now, as an adult, I can't help but fall in love with places like these. When I was a child I would have loved to explore a place like this, ghosts or not. I suppose things never change, do they?I wish I knew what exactly kept me from really enjoying this story. It truly has all the markings of a journey I'd normally fall in love with. Cotter writes of friendship and mystery, all with an undercurrent of deep uncertainty. I didn't dislike Polly or Rose, and the writing was smooth enough. Somehow it just lacked that bit of extra. The piece that keeps me glued to the page, and wanting to come back for more. That's all I can offer up to you. The Swallow: A Ghost Story is a fine read. It'll appeal to many a bookworm. It just wasn't exactly what I was looking for. You can read this and other reviews at Things I Find While Shelving[I received a free ARC of this book via NetGalley. This fact has no bearing on my review. ]This was quite the page turner!Polly longs to see ghosts, she devours ghost stories and dreams of one day meeting a spirit. Rose does see ghosts, and it isn't a picnic. They're everywhere and she has no idea why and she just wants them to go away.When Rose moves into the house next door to Polly, they meet by each initially believing the other is a ghost. They are in their attics, and Polly hears Rose singing through the wall and assumes she must be a ghost. They meet to prove to each other that they are alive, but when they find a grave stone with Rose's name on it, a whole mystery unfolds before them.Rose and Polly work together to discover the secrets Rose's family has been keeping since long before she was born. But as they dig deeper and deeper, Rose begins to worry that she is, in fact, a ghost. Through all of this, Rose and Polly develop a great friendship , but there's another secret neither of them sees coming that could ruin it forever.The Swallow keeps you reading. The characters are wonderful, the story is captivating, and though the style isn't one of my personal favorites (alternating, labeled POVs), it really works here - though I couldn't tell you why I feel that way, heh.Overall, a wonderful story. Polly and Rose live next door to each other. Polly's house is too full of people and her macabre tastes make her long to see a different kind of person, one who is no longer alive, ie, a ghost. Rose's house is the opposite of Polly's and is always empty and Rose has the dubious ability to see ghosts. The two soon strike up an unlikely friendship and Polly is right jealous of Rose's "gift." Yet maybe there's a reason she can see ghosts? There's a tombstone behind their houses with Rose's name on it... perhaps Rose herself is a ghost? One thing is clear, there is something strange going on and Polly thinks that the two of them need to get to the bottom of the spooky goings on; because one of them might be a ghost.If you've ever thought, wow there really needs to be a middle grade version of The Sixth Sense set in 1960s Toronto, then I have good news for you! If on the other hand you're looking for a story that isn't predictable like, oh, anything ever done by M. Night Shyamalan, look elsewhere. The main problem with The Swallow is that everything is so obvious. It's not like there was one of two things that surprised me. Oh no. Every. Single. Thing. Was. Expected. It's like Cotter has no ability to dissemble. She can't hide her story structure, and she certainly can't hide her big reveals. From the second Polly went into her attic I knew that there'd be a secret passage, because I'd read C. S. Lewis's The Magician's Nephew. Yeah, you didn't do a good job of hiding where that attic came from Cotter, much like everything else. But as to each reveal, they were delivered exactly when you'd expect it. There was no flow to this story, no chance for surprises. It felt as if Cotter sat down and wrote the most rigid structure she could to tell her story, with each reveal carefully placed, and when she went from outline to prose not one thing was allowed to vary from that outline. I felt at times as if the book was more a rigid structure of steal that had words around it then an actual narrative. You could feel the story gripping the spine trying to be a real book. A good author transports us and makes us not see the craft behind the work. Cotter pulled back the curtain on the wizard and showed us that writing isn't magic, it's labor intensive, and not just for her, but for us as readers as well. The only positive that can be said for this book is that it was a short read so the pain was quickly over. Though what is most aggravating to me is that this could have been a unique story! We have the 1960s, we have the ghostly aunt/doppelganger, vintage shoes, creepy pictures of Rose and Winifred dressed alike, and yet it felt like it could be happening right now because none of these interesting aspects are delved into or exploited for the benefit of the story! Instead we get two girls, Polly and Rose, who are just as annoying and whiny as any kid today with no sense given to us readers of how they fit into their time to better explore the sixties. They are completely unlikable in the beginning, and even if you grudgingly like them a little later, the jeopardy they get placed in is so badly contrived that they are never able to rise up and save the book. In a true sign that shows how utterly commonplace everything about the book is, the girl's voices are basically the same. If it weren't for their different situations and the little label saying who's head we're in, I doubt you could tell which girl was which. As for the ghosts. Well, I have problems with them. First, let's take the ghosts as a whole, and I won't talk about how thick Rose is, we'll just accept that as a given. The ghosts seem to have been given stupid characteristics, like the ability to eat and touch so that we wouldn't know that Polly was dead all along. Oops, I hope you hadn't planned on reading this book, because yeah, spoilers! Though with Cotter's writing if she'd been allowed to write the book's blurb, well, she would have signaled you into that twist in just those few short sentences. Since when can ghosts eat? Like seriously, I think this would be the number one thing on my "things ghosts can't do list." Haunt, yeah, move objects, yeah, give me nightmares, yeah, eat my food, NO! Also more specifically, Winifred is like the worst developed ghost ever. She's angry and crazy and remorseful and a loving sister? Yes, people can be a cornucopia of different personality traits, but, you know what? It has to be explained. Just having her go from crazy to contrite, it doesn't work.But what I really want to know is was this book a teaching moment? So many of the reviews and blurbs talk about how this book will help kids with concepts like grief and acceptance. If this book was written to tell a rigidly plotted story and it just happened to help with grief and acceptance, well, I'm ok with that. On the other hand, if this book was written just to teach kids about these concepts? NO! I am not a fan of the "teaching moment." I want learning to be a byproduct of reading not the be all end all. Plus, when did everything have to be made "improving" for children? All literature had to teach them lessons. All toys had to be educational. WTF people! How about literature is there to teach kids the joy of reading? And how about toys being there to grow their imagination? I loved toys but I was slow to books. If I had read this book as a kid, it would have put me even more off reading, it's middle grade meh. The Last Word: "Skylark"
Friendship, Mysteries, and Lots of GhostsYou know, there is quite a range of experiences out there if you like ghost stories. At one extreme you can have gore and horror. At the other end of the scale, especially if you're in a British manor house, you get mood, suggestion and something odd moving the teapot in the old study. This book, aimed at middle graders and younger YA's but interesting as well for older readers, falls in the happy medium. Even then, though, the book is mostly a friendship tale, and I mean that in the best possible way.Polly is invisible because she is a small part of a large, raucous family. She deeply wishes she could see ghosts. Rose is invisible because she is the only child of distant and inattentive parents. She deeply wishes she could stop seeing all of the ghosts that have surrounded her her entire life. The two girls end up neighbors, meeting for the first time from either side of an attic wall separating their homes.From that first meeting springs a friendship borne of their loneliness and their fascination, (from opposite perspectives), with ghosts. We follow both girls in alternating first person chapters, with their versions sometimes overlapping so that we get two views of most of the important developments. There are a number of mysteries to be addressed and resolved, and some unfriendly spirits to be confronted. There are multiple plots twining through each other and lots of satisfying twists and turns.Be forewarned. The opening chapters consist of a lot of kvetching and whinging, with each girl expressing an angsty funk that starts to get old. I confess I was almost tempted to stop reading, but this tween drama doesn't last very long, is there just to set up the girls' lonely situations, and disappears as soon as the girls meet. At that point the story takes off, and never looks back.It's very interesting to have a ghost story in which there is more at stake than just dealing with the ghosts. This is the story of a friendship. This would be a decent book if you dropped all of the ghosts and just made it into a coming of age novella. The two girls are distinct and endearing in their own ways. Their emotions, reactions, conversations, bonding, and loyalty to each other feels authentic and would, I think, appeal to a young reader. As a consequence of that, and because the ghosty parts are also quite good, this really strikes me as a happy and satisfying find.Please note that I received a free advance ecopy of this book in exchange for a candid review. Apart from that I have no connection at all to either the author or the publisher of this book. Though I enjoyed it, there are quite a few problems with this book--the biggest being the way the 1st person narration switches between the two girls. The POV change occurs way too frequently, jerking back and forth with intervals of a few paragraphs or even sentences; the story would have flowed better, without losing any of the personal touch the author seems to be going for, had they stuck to chapter-length intervals.However. Despite my frustration with the structure, my eye-rolling at the amateurish prose, I COULD NOT PUT THIS BOOK DOWN. It's been a while since a book so gripped me that I actually pushed myself to stay awake late at night, just to read one more chapter; this one did so. The constant shifting voice was a nuisance, but the book still manages to maintain a steadily building tension all the way through to the climax. The "twist" is a good one--some may see it coming, but I didn't, and thought it was effective in how it was delivered and how the characters reacted. Not by any means the best Juv book I've read, but I enjoyed it, and would recommend it to readers who like a good ghost story. I purchased this book with the intent of donating it to the local library but decided to give it a quick read before doing so and I'm so glad I did. A great story about friendship, family, and acceptance. Polly and Rose are both likable characters which most children (pre teens) will be able to find common ground. Filled with fun, mystery, and a little spookyness too. Hopefully a few young library goers will enjoy it as much as I did. I received a copy of this book in exchange for an honest review.I was interested in this book because it takes place in Toronto, Ontario and it sounded like a fun little ghost story and it didn't disappoint me. It follows two 12 year old girls (Polly and Rose) who couldn't be more opposite. Rose is quiet, shy, awkward girl who's an only child and Polly is very outspoken, adventurous girl who is part of a large family including siblings and foster children. The story is told from both girl's perspective, which I thought was a nice way of providing more story and insight into the girl's family lives. We also find out that Rose can see ghost, which is Polly's dream. We follow the girls through their adventures and discoveries. Charis has some nice twists and turns in there so that you aren't exactly sure what will happen next. I had many theories throughout the novel and each time I thought I knew what was going to happen in the end we learn new information. There were a couple of parts in the book that would scare younger children (of those who are more easily scared). I grew tense in a couple parts of the book and I wondered how exactly I would have reacted if I was more within the age group this was written for (closer to 12 years old).I haven't read many ghost stories and it was a perfect time to read it - being October and all). I couldn't put the book down - I wanted to know what would happen next, what the next twist would be, and how the girls would solve their mysteries. I really enjoyed this book and I would recommend this to anyone who likes ghosts, looking for a Halloween themed book, or into mysteries. I think even those who scare easily or do not typically like this genre would still enjoy it. It is not only a ghost story but a story of friendship and family and how to handle life's difficulties (from a child's perspective). It shows that it's ok to be different and to embrace those differences instead of wishing them away and hoping to be "normal". The Swallow: A Ghost Story, is such a wonderful, special book that I would pretty much recommend it to anyone.This novel by Charis Cotter tells the story of the friendship between two 12-year-old girls living in Toronto in 1963. Polly is outgoing, bubbly, and passionate, with a love for books and chocolate, and a huge, busy family. Rose is introverted, pale, quiet, and loves to sing. Rose lives in a house adjoining Polly's, and spends her time more or less alone, as her parents work long hours, and their housekeeper, Kendrick is a silent, brooding presence.One afternoon, the two girls meet each other unexpectedly (in a very funny scene, which I won't give away) and a very special friendship develops between these two seemingly opposite, but both, lonely, souls.What follows is a story that is hard to describe, part mystery, part drama, part ghost story, but ultimately, a tale about friendship that transcends time and place.In The Swallow, Charis Cotter has created something magical, something ineffable. Her story contains something that is more than the sum of its parts, or of its words and plot. The Swallow walks this fine line, like the crack between two worlds, or the mysterious space between life and death. The beautiful book cover captures the feel of this enchanting, ghostly, sad yet joyous novel perfectly.The Swallow is the best of books, a middle grade novel that will appeal to adults as well as children, and a book that takes its readers into the creative space of imagination, in which anything is possible. Charis Cotter knows ghosts. After reading The Swallow: A Ghost Story, I'm a believer too! This middle-grade (juvenile fiction) book does all the things a ghost story is supposed to do: it's spooky, tricky and fast-paced. What's she's managed to do is uphold these elements through the young yet scarily innocent voices of two young girls. At first, the bouncing back between Polly and Rose, and the constant mirroring of their lives, was a bit jarring - but as I continued to read, I understood this as a writing device that enables young readers to 'double-connect', if you will. Since this book is written for young people, Cotter had to make sure the language, plot and characters fit this audience. She did this successfully! As this is not her first book for children, Cotter knows her young audience well, and her expertise in all things 'ghost' finds its way to the pages of her first novel in a way that makes this book a page-turner with twists and turns that make it difficult to put the book down..unless, of course, you get too scared. Which I was, on several occasions! And I'm a grown-up (at least as far as my age is concerned! ).That the story takes place in 1960s Toronto, ON, Canada, was an added ghostly treat! I look forward to sharing this story with my kids - when they get a bit older! An excellent read for young readers and old alike! Congratulations Charis! Boo! A well-spun mystery wrapped in a ghost story and tied together with friendship. Polly and Rose are two 12 year olds who accidentally meet (separated by a wall) while hiding out in their respective attics. They spend a fair amount of time trying to figure out if the other is a ghost and a greater amount of time developing a meaningful friendship. Polly longs to meet a ghost and the Rose wishes she didn't see ghosts all the time. The two team up to unravel a family mystery, sharing the narration in alternating snippets. It's a little confusing at first since the story moves quickly and the voices seem rapid-fire, but it's an effective way to tell this tale. The creep factor is enough to engage the reader and give some chills, but not enough frighten young readers away. I think middle grade readers and even some teens will enjoy the pace and the deft way the story is resolved. I received the e-galley from NetGalley.com. 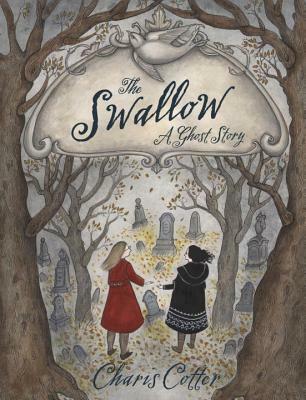 ****An Advance Reading Copy of The Swallow: A Ghost Story by Charis Cotter was generously provided to me via NetGalley in exchange of honest review.This book is about two girls who live next to each other yet have a very different life. Rose, the quiet one, is basically live a "nerd" life; ignored . She also can see ghosts, which made her more feel isolated and different than others. Polly, the lively one, live a pretty happy life. And guess what? She's dying to see ghosts! They find each other and create a friendship that will change their life. I liked it! Even though I wish the book could get a bit longer, overall i enjoyed this book so much. The style of writing of this author is easy to understand, I guess it's because this book is for children, yet I don't really feel that this book is "too children-ish". It's mature in a children way and I bet my 12 year old cousin would enjoy this book as well! Look forward to read another book by this author!! If you've read Summer Days, Starry Nights you know I love the sixties. This period in Toronto is evocatively portrayed in this moody, unsettling ghost story by Canadian author Charis Cotter. The atmosphere reminded me of Janet Lunn's old-school storey Double Spell, peopled with well-rounded Kit Pearson-esque characters.It's hard to talk about this book without giving too much away. The stuffy, cloying house was particularly vivid, as was Polly's large, rambunctious extended family. I will say that as an avid reader of ghost stories, this was a refreshing take on the genre. It is just as much a friendship story between two lonely girls as it is a spooky read. Cotter captures the anxieties and frustrations of tweens very well. Fans of Janet Lunn, Kit Pearson and Jonathan Auxier will appreciate this well-crafted story. A sad, sad book with some not very sad parts. I was very sad for what Rose had to go through. It was funny at the very start when Polly and Rose had an argument about who was the ghost! I like that the ghosts are ghosts until someone helps them.At first I had a hard time reading from two points of view. Then it got a bit easier and I liked getting to see two sides of the story. I had to ask my mom what meningitis was, and it was a very long chapter book but it was so interesting and I did cry just a bit near the end! I feel like Rose and Polly are my friends now, too... and my middle name is Rose!I received this book through Netgalley for an honest review. Best ghost story ever!This is not a traditional ghost story where an entity is going around spooking everyone. No, this is about two young girls and one is a ghost. For most of the story, you believe one thing about the ghost and then all of a sudden, like a truck coming out of nowhere, the story becomes epic! Everything you thought you knew becomes something totally different and it works!This is such an intricately told tale that had me guessing, intrigued and in awe throughout. I even got choked up a few times. Yeah, choked up during a ghost story... stop laughing.I know so many of you will enjoy this story as much as did. A touching story of friendship, grief and acceptance.The Swallow started off somewhat weak and bland for me, and the constant switching between POVs only seemed to exacerbate that weakness by disrupting the natural flow of the narrative. However, its mystery kept coaxing me forward, which really picked up around page 160. Ultimately, the friendship between Polly and Rose won me over, and I'm happy I read this book.Recommended to middle graders who want a story with equal parts ghost and heart.3.5 starsReceived hardcover from the publisher in exchange for an honest review. ★★★★☆ für Charis Cotter: "Das unsichtbare Mädchen"Zur Rezension: http://secretsofrock.net/…/rezension-...Zusammenfassung:Eine bewegende Geschichte über eine Freundschaft von zwei ganz besonderen Mädchen. Das eine wünscht sich nichts lieber, als echte Geister zu sehen. Die andere wünschte, die Geister würden endlich verschwinden.Charis Cotter schafft die besondere Freundschaft, emotional und authentisch zu übermitteln. Dazu trägt vor allem der malerische Schreibstil bei, der diese "Geister"-Geschichte auf einzigartige Weise zum Leben erweckt. Like "Doll Bones," this book is framed by a ghost story, but the real story is in the wonderful relationship between the characters. 3.5 starsI'm somewhat conflicted as far as how I feel about this book. I really, really enjoyed. But I also had some quibbles with it. So. I hardly ever do this, but let's do a pros and cons list.PROS:- It's eerie but not terrifying, just my kind of ghost story. I've pretty much always been obsessed with ghost stories, but they have to be the right kind, the kind that are more sweet than scary.- Although I can now see that there were clues along the way, the denouement definitely took me by surprise.- Relating to that, there was a lot of misdirection about where the story was going to lead. I happen to love misdirection, as long as it's later explained, which it was for the most part.- Rose and Polly's friendship rang true for me. The little clashes caused by their personality differences, the way that Polly brought joy to Rose's quiet little life and Rose brought Polly back down to earth when needed, the strong loyalty that grew between them, it all added up to a really beautiful friendship.CONS:- There was a lot that was left unexplained. Sometimes, I'm okay with that, but in this book, it felt like certain things were brought up intentionally and then never really addressed properly, which is kind of maddening.- The book is told from two points of view, Polly's and Rose's, and I like that part of it (I guess I should add that to the Pros), but the switches happened so quickly that it often felt choppy. I kind of got used to it, and sometimes it worked, like when the action was happening quickly. But most of the time, it was kind of confusing.OTHER RANDOM NOTES:- I love all the little clues that I now realize were hiding in plain site, (view spoiler)[like Polly's mom never actually talking to her, and how upset she got when the boys played in Polly's room (that one was interesting because even while I was reading it, I was thinking, "That's seems to be an unnecessarily emotional response to a simple transgression" but it makes sense if Polly was dead; of course she doesn't want the boys to play in Polly's room); how sad Polly was that her dad never talks to her anymore, but seemed to transfer his affections to Moo and Goo; how, when Polly's brothers told her to stop taking cookies because they were getting blamed for it and she said, "It's OK, I'll just tell Mom I took them" and her brothers got upset and said, "NO, just stop taking them!" because they knew if Polly tried to talk to their mom, she would realize she was dead (hide spoiler)].- I honestly still don't exactly get all that stuff about how (view spoiler)[Rose was just like Winnie (same name, going to the same school, seeing ghosts, etc) (hide spoiler)]. Was that supposed to mean something? Or was it just a misdirection that never really got explained?- This book is a slow burn. A REALLY slow burn. But the story was engaging enough to make me keep reading, and the end was definitely a payoff for the wait. Polly and Rose, although coming from very different families, are uniquely alike. They both perceive themselves as invisible...the only difference is that Polly comes from a loud, boisterous family and Rose is an only child. Yet, no one ever really sees them, talks to them, or understands them. That is, until they find each other. Living in houses that are side-by-side, they find a connecting way into each other's house through an attic trapdoor. Polly is convinced that Rose is a ghost, with her pale face, gloomy clothes, and whisper-like movements. Rose is convinced she isn't a ghost, but she knows she can see them and communicate with them. Together, the girls attempt to solve the mystery. They hunt for clues, finding them in forbidden rooms inside the houses, the attached attic hideaway,and the local library. As the mystery is unraveled, the girls learn some very shocking things about each family and how they are connected. Through it all, Polly and Rose are there for each other as they have become best of friends. How it all ends is rather shocking, but plausible. The Swallow: A Ghost Story has just enough scariness for upper elementary schools kids wanting a ghostly story. Tightly wrapped up in a mystery, the ghosts who appear are, at times, evil but not over-the-top ghoulish. And, some ghosts are kind and attentive. A fun story for Halloween time! Thank you to Tundra Books, Penguin Random House Canada Young Readers Publishing, LibraryThing Early Reviewers, and Charis Cotter for this ARC. Charis Cotter - Charis Cotter is a writer, editor and storyteller living in Newfoundland. She grew up in Cabbagetown and Parkdale in downtown Toronto. After taking a degree in English at Glendon College, York University, she went on to study acting at The Drama Studio in London, England. After several years as an actor, she moved into publishing, where she has been working as a freelance editor and writer for more than 20 years.In 2005 Charis won the Heritage Toronto Award of Excellence for her book, Toronto Between the Wars: Life in the City 1919–1939. Since then she has written several critically acclaimed children’s books, including a series of biographies about extraordinary children and an illustrated book about international ghosts. Born to Write: The Remarkable Lives of Six Famous Authors was a finalist for the 2010 Norma Fleck Award for Canadian Children’s Non-fiction. Charis first toured schools as an actor in a Young People’s Theatre production of W. O. Mitchell’s "Jake and the Kid." Her favourite part of the show was interacting with the students during the question period after the play. Today Charis is known for her lively school presentations, based on her books. She has toured Canada from coast to coast, entertaining children with her alter egos: Queen Elizabeth II (complete with gown, crown and royal attitude) and the Scottish Silky Ghost, who dusts everything in sight, including children. Her fascination with ghosts has led her to many far corners of Newfoundland, looking for ghost stories.In 2013 Charis founded her own publishing company, Baccalieu Books, to publish The Ghosts of Baccalieu. She created this book with the students from Tricon Elementary School in Bay de Verde, with funding from ArtsSmarts. * Students contributed drawings and traditional ghost stories collected from the community. Charis has sold The Ghosts of Baccalieu to libraries, bookstores and the general public, with a portion of the revenue going back to Tricon Elementary. Charis continues to do ghost storytelling workshops at schools, community centres and book festivals. She reviews children’s books for the National Reading Campaign, Quill and Quire and The Canadian Children’s Book News.The Swallow: A Ghost Story, was published by Tundra Books (Random House) in September 2014. This spooky gothic novel, set in Cabbagetown, Toronto, in the 1960s, is partially based on Charis’s childhood experiences living behind a cemetery. The German translation rights have been purchased by cbjVerlag/Random House Germany, who will publish it as Das Unsichtbare Mädchen (The Invisible Girl). The school presentation for The Swallow features a theatrical performance of an excerpt from the book and a ghost-story writing workshop. *ArtsSmarts is sponsored by the Newfoundland and Labrador Arts Council and the Department of Education through the Cultural Connections Strategy.